The microphone is used for speaking voice commands or when making a Hands-free call. 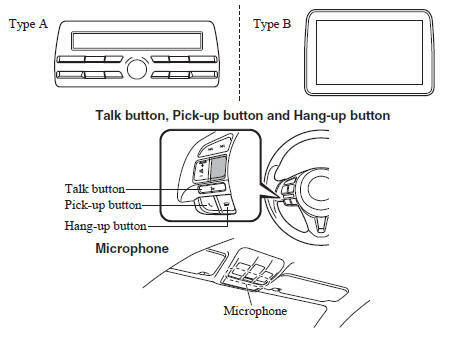 Talk button, Pick-Up button and Hang-Up button (hands-free) The basic functions of Bluetooth ® Hands-Free can be used for such things as making calls or hanging up using the talk, pick-up and hang-up buttons on the steering wheel. The commander switch is used for volume adjustment and display operation. Tilt or turn the commander knob to move the cursor. Press the commander knob to select the icon. The power/volume dial of the audio unit *1 or the volume dial of the commander switch *2 is used to adjust the volume. Turn the dial to the right to increase volume, to the left to decrease it. The volume can also be adjusted using the volume button on the steering wheel. NOTE If the volume is lower compared to other audio modes, increase the volume from the device side. Conversation volume and the volume of the voice guidance and ringtone can each be set in advance. screen to display the Communication screen.